OTTAWA - The Conservative government that earlier this year killed the long-gun registry now says placing serial numbers on rifles and shotguns contributes to public safety by allowing police to trace them to their legal owners. Starting Dec. 1, long-delayed rules on gun markings will come into force, the Public Safety Department announced by posting the new regulations in the Canada Gazette. 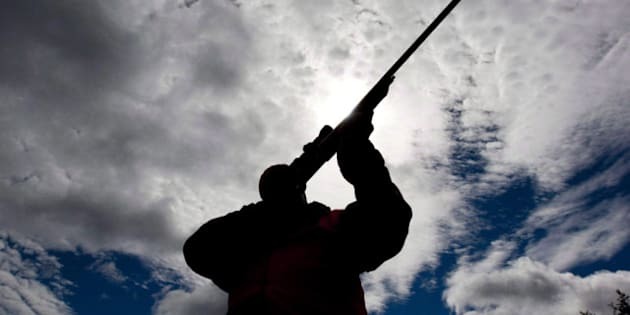 After years of demonizing the Liberal-built long-gun registry as not only "wasteful" but also "ineffective," the Harper government says there is some utility after all in being able to track sport and hunting weapons. "We are requiring firearms to be permanently marked with a serial number to distinguish them from other firearms," Julie Carmichael, a spokeswoman for Public Safety Minister Vic Toews, said in an email. "This will assist law enforcement without placing undue burdens on law-abiding hunters, farmers and sport shooters." The Canada Gazette backgrounder is even more direct, stating the "rationale" for the new rules is police investigations. "The proposal would establish basic marking requirements to facilitate the identification of firearms and to contribute to public safety, by facilitating law enforcement investigations when the markings can be linked to information on the last legal owner of the firearm," says the Public Safety document. The introduction to the government backgrounder says the new rules will "ensure that all firearms continue to be marked to facilitate firearms identification, including crime gun tracing by law enforcement." Yet the same document notes that the end of the national long-gun registry severely limits the utility of such gun markings, making them "only of limited use in the tracing of non-restricted firearms used in crimes." Last June, the Conservatives also introduced legislation to ensure gun dealers don't have to keep records identifying buyers of non-restricted weapons. In effect, serial numbers on rifles will be as useful as a licence plate or VIN de-linked from any vehicle owner database. Investigators will be able to determine where and when the gun was made, and when it was imported to Canada, but not much more. And unlike the original 2004 regulations that have been postponed three times by the Harper government, the rules taking effect in December will not be enforced on gun makers, there will be no compliance measures and no penalties for non-compliance by gun owners. Since reputable gun makers already include unique serial numbers on every weapon they produce, the new regulations have critics scratching their heads. Toews' spokeswoman, when asked to explain the government line, responded: "This is placing the responsibility to deal with law enforcement on the firearms manufacturer, rather than law-abiding hunters, farmers and sport shooters." Even gun advocates are dismissing the government spin. "It's an import regulation, it's not a gun-control measure," said Tony Bernardo, spokesman for the Canadian Shooting Sports Association which was consulted on the regulatory changes. "If they spin it as a public-safety measure, quite frankly I don't see how they justify that," Bernardo said in an interview. "Knowing how a firearm may have come into the country 12 years ago tells you exactly what at a crime scene? It doesn't really tell you anything." Bernardo said the real reason for the new regulations is international protocols. "It's quite simple. It's to comply with the UN." The government documents say the measure will "meet some of the specifications" of two international protocols that Canada has signed — a United Nations protocol on firearms trafficking and a similar treaty with the Organization of American States. And it notes there was a "gap" in those international protocols with the repeal of the federal registry. "It's a cosmetic move to be able to say they're abiding by an international convention," said Liberal critic Francis Scarpaleggia. His NDP counterpart Randall Garrison called it "too little, too late." "This is a long-delayed regulation that if it had come into place when there was a gun registry, it would have allowed police to trace guns based on the information of the last owner," said Garrison.